Several members of the Music Department joined students studying at every level, from Level 1 to the MA, for a Study Day at the Southbank Centre, London, on 19 March. The following review is by one of the participating students, Valerie Morris (a current A873 student). 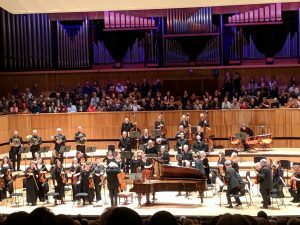 Sir András Schiff joins in the applause for the OAE, who received a standing ovation at the conclusion of the concert. This week saw the OU’s partner orchestra, the Orchestra of the Age of Enlightenment, give two concerts under the direction of Sir András Schiff. On Tuesday 19th March OU music students from across all levels took part in a study day at the Southbank Centre run by OU music staff. The first session featured two members of the orchestra, Nick Logie (viola), who gained his PhD with the OU, and Leo Duarte (oboe). They explained and demonstrated how OAE musicians follow and lead in performance when playing without a conductor by listening and reacting to each other, and discussed such things as 19th century oboe tonalities, use of gut strings, and different placings of the lower strings sections of orchestras. This all made sense when we watched the final rehearsal of Brahms’ 2nd piano concerto with Sir András conducting from the 1867 Blüthner piano: he has a masterful ease in conveying exactly how he wants the orchestra to sound, using very few words and gesturing with his arms and singing the phrasing he wants. In the rest of the day, the OU’s Alex Kolassa and Martin Clarke led a session on Influence and Innovation, showing how much ‘old’ music is in ‘new’ music; Byron Dueck talked about current and future music modules, including Alex’s examples of modal writing in Metallica songs; and Bob Samuels gave a public pre-concert talk saying that Brahms’ relationship with Clara Schumann is the When Harry met Sally story in classical music. Thank you to all involved. 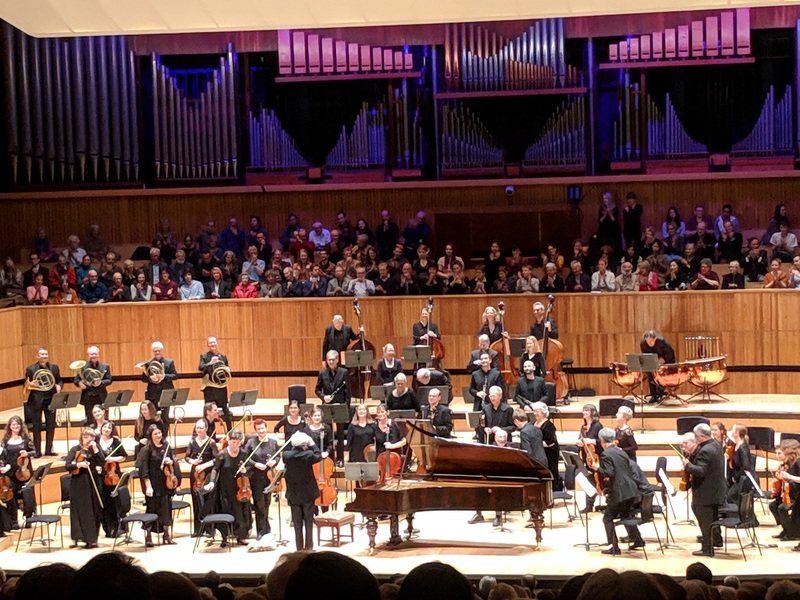 At the evening’s concert (pairing the Brahms concerto with Schumann’s Symphony No.3 ‘Rhenish’) Sir András spoke directly to the audience, telling us playing without a conductor is like playing without the police, and sometimes it’s good not to feel safe! It was a terrific performance. This was a really enjoyable day. My previous experiences of study days have been focussed on how much work I’d have to do for forthcoming exams or EMAs but this event was learning for learning’s sake as well as a chance to have a good chat with other students.